CURTAINS > WHAT ARE PENCIL PLEAT CURTAINS? 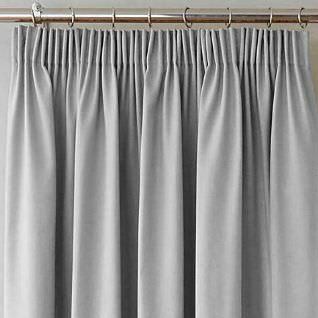 What are Pencil Pleat Curtains? Pencil pleat curtains are, along with eyelet curtains, one of the two most popular styles of curtains on the market. The name is derived from the curtain’s heading, which resembles a line of tightly-packed pencils. Pencil pleat curtains make a great match for more traditional interiors, but there’s no reason they can’t complement more contemporary style homes, too. How do pencil pleat curtains work? Pencil pleat curtains can be attached either to a pole or a track, which can be made from metal, plastic or wood. By moving the heading tape up and down, a more pronounced ‘ruff’ can be created at the top of the curtain. Add to this all the different colours and materials that pencil pleat curtains come in, and you’ll be spoilt for choice – whatever your style. Pencil pleat curtains are arguably more elaborate than other styles of curtain, including eyelet curtains. This is particularly so at the rear of the curtain, where the fabric is attached to the hoops via a series of threaded strings that must be loosened to clean the material. As such, pencil pleat curtains tend to be a little more difficult to maintain than eyelet curtains – but given the right interior, the extra effort is well worth it. Are pencil pleat curtains old-fashioned? Many people believe that pencil pleat curtains are old-fashioned when compared to eyelet curtains, which have ringlets incorporated into the fabric itself - but this is far from a blanket rule. Pencil pleat can look just as stylish as eyelet curtains in a contemporary apartment or new-build house. That said, the classic appeal of a pencil pleat curtains will almost certainly make a good match for an older property – whether it’s a Georgian town house or a Victorian cottage. Bedrooms, lounges and dining areas will benefit especially. Curtains tend to come in standard sizes, so if your home is relatively new, buying the right size curtains should be easy. If you’re shopping for an older property, however, measuring up carefully is key. One of the defining characteristics of a set of pencil pleat curtains is the pleating itself. If they’re pulled entirely taut when closed, they won’t be pleated. Consequently, your curtains need to be larger than the space they’re going to cover. This will be determined by the track or rail from which they hang, which should be around 15 centimetres taller than the window, and 30 centimetres wider. Are you looking for a pair of curtains? Divide the length in two, and you’ll have the length of each curtain. But equally, they’ll need to meet in the middle, and overlap (otherwise they won’t effectively block out light). For this reason, allow for an extra twenty centimetres on each side. Obviously, if you’re going for a single large curtain rather than two individual ones, then you can skip this step. Your curtains will, of course, need to be as long as the rail - but pleated curtains will need to be twice as long if they’re to hang correctly. You’ll also need to decide on a height for your curtains – either sill-length, below-sill, or right down to the floor. Ready to shop for new curtains? You’ll find our pencil pleat curtains here. Alternatively, view our eyelet curtains, tab top curtains or slot top curtains. Which is the Best Fabric for Curtains? Do Curtains Have to Be Lined?